Mesangial cells and podocytes express integrins α1β1 and α2β1, which are the two major collagen receptors that regulate multiple cellular functions, including extracellular matrix homeostasis. Integrin α1β1 protects from glomerular injury by negatively regulating collagen production, but the role of integrin α2β1 in renal injury is unclear. Here, we subjected wild-type and integrin α2-null mice to injury with adriamycin or partial renal ablation. In both of these models, integrin α2-null mice developed significantly less proteinuria and glomerulosclerosis. 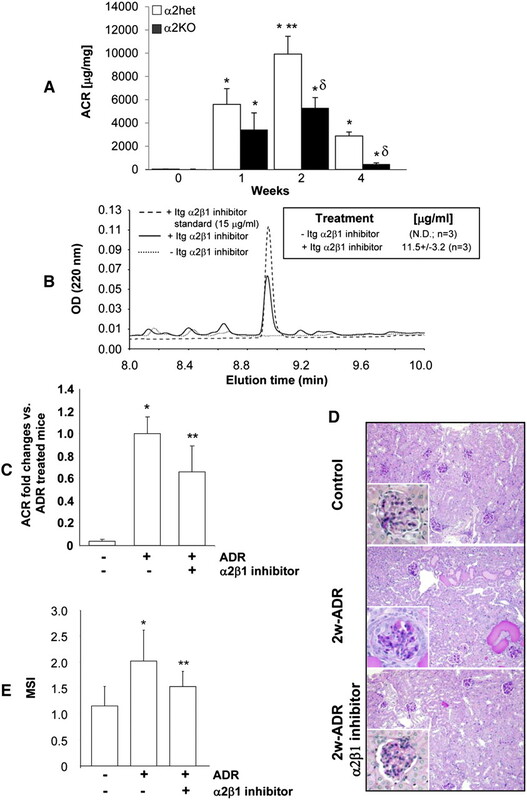 In addition, selective pharmacological inhibition of integrin α2β1 significantly reduced adriamycin-induced proteinuria, glomerular injury, and collagen deposition in wild-type mice. This inhibitor significantly reduced collagen synthesis in wild-type, but not integrin α2-null, mesangial cells in vitro, demonstrating that its effects are integrin α2β1-dependent. Taken together, these results indicate that integrin α2β1 contributes to glomerular injury by positively regulating collagen synthesis and suggest that its inhibition may be a promising strategy to reduce glomerular injury and proteinuria. The most common cause of end stage kidney disease is glomerulosclerosis, which is characterized by excessive collagen deposition in the glomerulus. Although numerous disease processes can initiate glomerular injury, they all result in abnormal glomerular collagen homeostasis with progression. Glomerular collagen turnover is regulated by multiple factors, including growth factors and profibrotic reactive oxygen species (ROSs) as well as cell extracellular matrix interactions mediated by the matrix receptors integrins (reviewed in ref. 1). Of these factors, the mechanisms by which integrins regulate glomerulosclerosis are the most poorly understood. Integrins consist of two noncovalently associated α- and β-subunits that combine to form 24 different heterodimers in mammals (reviewed in ref. 2). The integrin extracellular domains contain the ligand binding site and confer ligand specificity, whereas the cytoplasmic domain interacts with the cytoskeleton and regulates cell signaling. Integrins control critical cell functions, including proliferation, survival, migration, and matrix homeostasis (reviewed in refs. 1 and 2). Thus, it is not surprising that integrins regulate tissue responses to injury in whole organisms. The best-studied integrin in the context of glomerular injury is the major collagen IV receptor, integrin α1β1, which is expressed by mesangial cells3 and podocytes.4 We have shown that integrin α1β1 is a negative modulator of glomerular injury by showing that integrin α1-null mice develop more severe glomerulosclerosis after injury, which is characterized by excessive collagen IV deposition, ROS generation, and EGF receptor activation.3,5 We also showed that integrin α1β1 negatively regulates EGF receptor activation, generation of profibrotic ROS, and consequent collagen levels in mesangial cells in vitro.3,6 More recently, we showed that integrin α1β1 also exerts its antifibrotic role by regulating both the level and phosphorylation state of caveolin-1,7,8 a scaffolding protein that alters EGF receptor activation. Taken together, we have shown that integrin α1β1 protects mice from glomerular injury by controlling many cell signaling pathways that regulate collagen synthesis. The role of integrin α2β1, the principal collagen I binding receptor, in regulating glomerulosclerosis is poorly defined. On one hand, a recent report suggests that integrin α2β1 protects from glomerular injury, because integrin α2-null mice on the C57Bl/6 background develop proteinuria at 6 months of age and mild glomerular and tubulointerstial damage caused by increased expression of TGF-β and connective tissue growth factor.9 On the other hand, it was shown that integrin α2β1 exacerbates glomerular injury, because crossing COL4A3-null mice, a mouse model of Alport disease characterized by progressive renal fibrosis, with the integrin α2-null mouse resulted in increased survival, improved renal function, and decreased glomerular matrix deposition and scarring (Gross O, et al., unpublished data). The latter study is more consistent with literature in nonrenal cells indicating that integrin α2β1 is a positive regulator of collagen and ROS synthesis.10,11 Furthermore, integrin α2β1 expression is required for TGF-β–mediated collagen gel contraction and remodeling,12 and increased expression of integrin α2β1, both at baseline and after TGF-β treatment, has been detected in fibroblasts derived from patients with hereditary gingival fibromatosis.13 Thus, despite the development of proteinuria and mild fibrosis in the integrin α2-null mice, the data suggest that, in contrast to integrin α1β1, integrin α2β1 is a positive regulator of collagen synthesis, and its upregulation is associated with fibrotic diseases. Because of the lack of clarity on the role of integrin α2β1 in modulating glomerulosclerosis, we examined the effects of either genetic deletion or pharmacological inhibition of this integrin in the setting of glomerular injury, because mesangial cells and podocytes express integrin α2β1.3,4 Two injury models were used in the genetic approach. In the first model, BALB/c mice were injected with adriamycin, which induces proteinuria, focal segmental glomerulosclerosis, and tubulointerstitial fibrosis because of ROS generation3 (reviewed in ref. 14). In the second model, 129Sv/ev mice were subjected to partial renal ablation (5/6 nephrectomy), which induces intraglomerular hypertension that results in proteinuria and glomerulosclerosis.15 In both models, the integrin α2-null mice developed significantly less proteinuria and reduced glomerulosclerosis. To confirm the beneficial effects of inhibiting integrin α2β1-dependent signaling in the setting of glomerular injury and more importantly, to translate these findings to a more clinically relevant setting, we pharmacologically inhibited integrin α2β1 with a selective high-affinity, nonpeptide small-molecule inhibitor16 immediately after injecting BALB/c mice with adriamycin. Treatment with this inhibitor significantly reduced proteinuria, glomerular injury, and collagen deposition. We also show in vitro that this inhibitor significantly reduced collagen synthesis in wild-type but not integrin α2-null mesangial cells, showing that its antifibrotic effects are integrin α2β1-dependent. Thus, our data indicate that integrin α2β1 is a positive regulator of collagen synthesis; it plays a deleterious role in the course of glomerular injury, and blocking integrin α2β1-mediated collagen synthesis with chemical inhibitors is a potential therapeutic strategy to reduce glomerular fibrosis after injury. To address the function of integrin α2β1 in the glomerular response to injury, we induced glomerular injury in wild-type (WT) and integrin α2-null (α2KO) mice by a single tail vein injection of adriamycin (a model of focal segmental glomerulosclerosis in the BALB/c strain)3,17 and partial renal ablation (a model that induces hypertension, proteinuria, and glomerulosclerosis in the 129Sv/ev strain).15 The same types of injures were also performed on integrin α1-null (α1KO) mice, which we showed to be a model of exacerbated glomerulosclerosis after injury.3,5 In contrast to the integrin α1KO mice, which had a significantly increased urinary albumin to creatinine (ACR) ratio compared with WT mice, there was a twofold reduction in ACR at 8 weeks postadriamycin injection in the integrin α2KO mice compared with WT mice (Figure 1A). Similar results for the ACR ratio were seen in 129Sv/ev mice post-5/6 nephrectomy (Figure 1B). Thus, the integrin α2KO mice develop less proteinuria than WT mice or integrin α1KO mice after glomerular injury. Reduced albuminuria in injured integrin α2-null mice. (A and B) WT, α1KO, and α2KO mice (n=5–6/group) were left untreated (control), administered a single injection of adriamycin, or subjected to 5/6 nephrectomy. The urinary ACR was analyzed (A) 8 or (B) 12 weeks after renal injury. Data are presented as the mean and SD of five to six mice. Differences between injured α1KO versus WT (*) or WT versus α2KO (**) were significant (P<0.05). The renal injury in kidneys from WT, α1KO, and α2KO mice was assessed by histologic examination. As previously shown, by week 8, adriamycin-treated WT mice had severe mesangial expansion and well developed glomerulosclerosis with a mesangial sclerosis index (MSI) score of 2.6±0.7 (Figure 2, A and B). 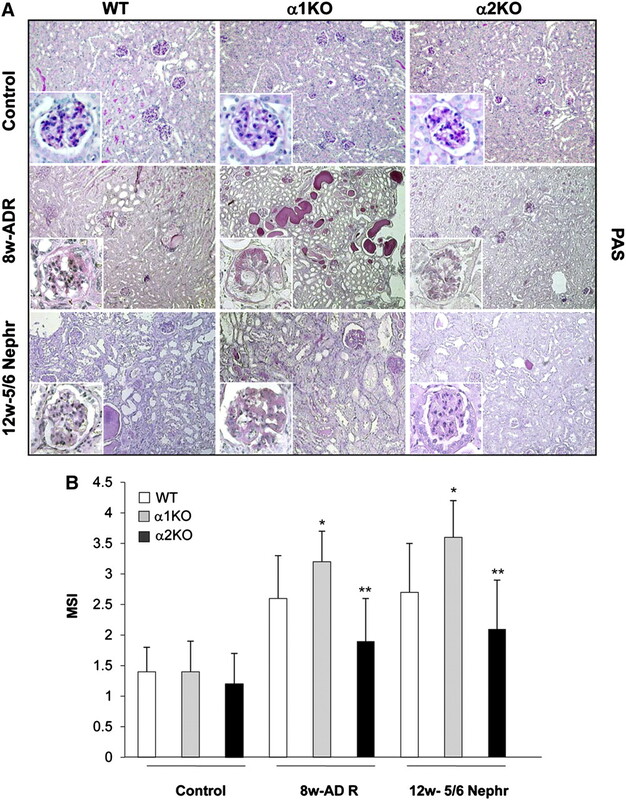 There was also significantly more severe glomerulosclerorsis with an MSI score of 3.2±0.5, interstitial fibrosis, and significant amounts of proteinacious material in the tubules of injured α1KO mice (Figure 2A). In contrast, there was significantly less glomerular injury, glomerulosclerosis with an MSI score of 1.9±0.7, and tubulointerstitial fibrosis in the integrin α2KO mice treated with adriamycin (Figure 2, A and B). Similar differences in glomerulosclerosis, as reflected by the MSI scores, were seen among the different strains of mice 12 weeks after 5/6 nephrectomy (Figure 2, A and B). Attenuated glomerulosclerosis in injured integrin α2-null mice. (A) Periodic acid-Schiff staining of kidneys from WT, α1KO, and α2KO mice left untreated (control), 8 weeks after adriamycin injection, or 12 weeks after 5/6 nephrectomy. (B) MSI was evaluated in untreated, 8 weeks adriamycin-treated, or 12 weeks after 5/6 nephrectomy mice in a blinded fashion, and the percent of mesangial matrix occupying the glomerulus was scored as one (0–24%), two (25–49%), three (50–74%), and four (>75%). Data are presented as the mean and SD of 120 glomeruli (30 glomeruli/mouse with a total of four mice evaluated). Differences between injured α1KO versus WT (*) or α2KO versus WT (**) were significant (P<0.05). Controls represent uninjured BALB/c mice. These results indicate that loss of integrin α2β1 is beneficial in the setting of glomerular injury, because it protects from the development of glomerulosclerosis and reduces glomerular injury-mediated proteinuria. One of the key features of glomerulosclerosis is increased collagen deposition. We initially assessed the amount of glomerular fibrillar collagens by performing Masson’s trichrome staining. In both injury models, there was clearly more staining in the injured glomeruli of the integrin α1KO mice and less in the integrin α2KO mice compared with WT mice (Figure 3). Because collagen IV is the principal collagen induced in glomerulosclerosis, we examined collagen IV deposition in kidney sections from uninjured mice or 12 weeks after 5/6 nephrectomy. 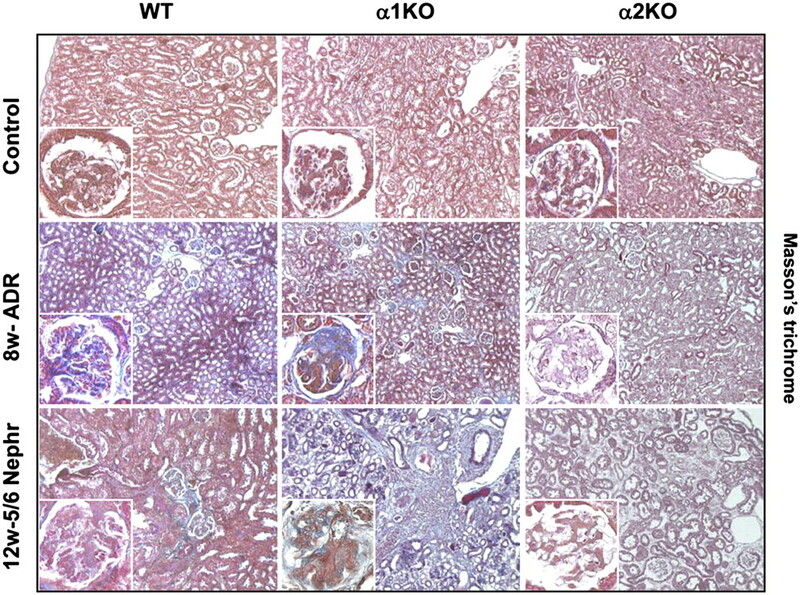 Kidneys from injured integrin α2KO mice showed decreased glomerular collagen IV deposition (particularly evident in the mesangial area) compared with either WT or integrin α1KO mice (Figure 4A). These data were confirmed by Western blot analysis performed on total kidney lysates from uninjured and 5/6 nephrectomy-injured mice, which showed a fourfold reduction in the levels of collagen IV in the kidneys of injured integrin α2KO mice compared with injured WT mice (Figure 4, B and C). As expected, the levels of collagen IV in the kidneys of injured integrin α1KO mice were approximately twofold higher than the levels detected in WT mice (Figure 4, B and C). These results suggest that integrin α2β1 positively regulates collagen IV synthesis in the context of kidney injury. 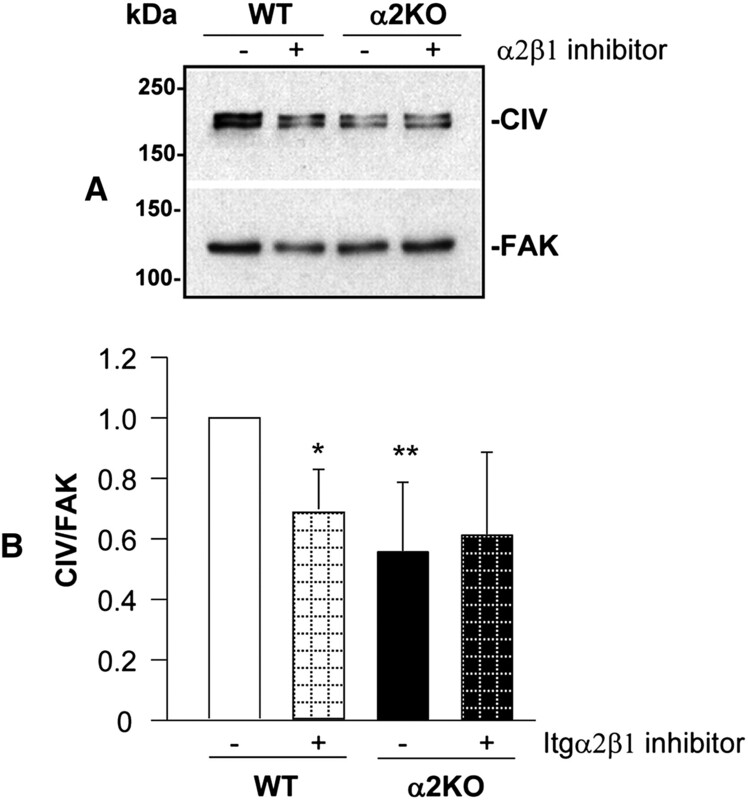 Reduced glomerular fibrosis in injured integrin α2-null mice. Masson’s trichrome staining of kidneys from WT, α1KO, and α2KO mice left untreated (control), 8 weeks after adriamycin injection, or 12 weeks after 5/6 nephrectomy. Controls represent age-matched uninjured BALB/c mice. Reduced glomerular collagen IV deposition in injured integrin α2-null mice. (A) Collagen IV staining of kidney sections from WT, integrin α1KO, and integrin α2KO mice untreated or 12 weeks after 5/6 nephrectomy. (B) Kidney lysates from WT, integrin α1KO, and integrin α2KO mice (n=3/group) untreated (control) or 12 weeks after 5/6 nephrectomy were analyzed for the level of collagen IV by Western blot analysis. (C) Collagen IV and β-actin (used to verifying loading) bands were quantified by densitometry analysis, and the collagen IV level is expressed as collagen IV/β-actin ratio (CIV/β-actin). Data are presented as the mean and SD of three kidneys per group. Controls represent age-matched uninjured 129Sv/ev mice. Because most of the changes in glomerular collagen IV deposition observed in injured mice were evident in the mesangium area and integrin α2β1 is expressed by mesangial cells,3 we isolated mesangial cells from WT, integrin α1KO, and integrin α2KO mice and analyzed their collagen IV production in vitro. Western blot analysis revealed that, unlike mesangial cells lacking integrin α1β1, which produce significantly more collagen IV than WT cells, integrin α2KO mesangial cells produce significantly less collagen (Figure 5, A and B). Because integrin α2β1 is a positive regulator of profibrotic ROS11 and integrin α1KO mesangial cells synthesize more collagen IV than WT cells, in part because of increased production of ROS,3 we examined ROS production by α2KO mesangial cells. 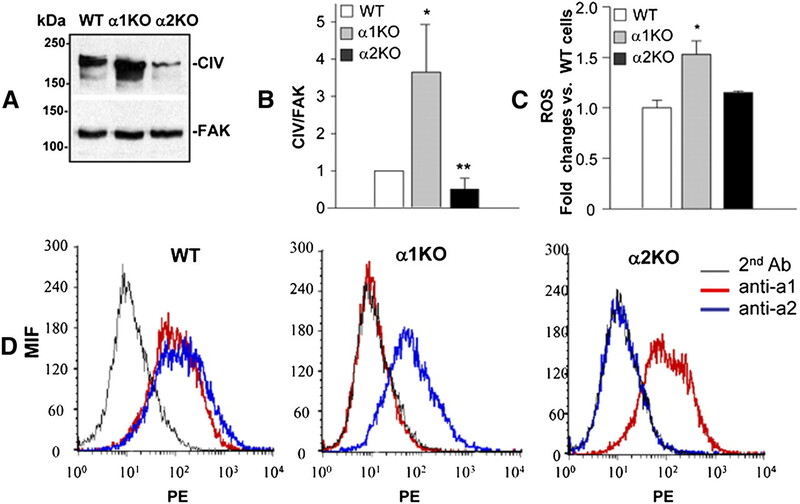 As described previously, integrin α1KO cells produce significantly more ROS than WT cells; however, surprisingly, no significant difference in the ROS levels between WT and integrin α2KO cells was found (Figure 5C). These data suggest that integrin α2β1 positively regulates collagen IV synthesis by an ROS-independent mechanism. Another mechanism whereby loss of integrin α2β1 might result in reduced collagen IV production is that its loss could increase the synthesis of integrin α1β1, a negative regulator of collagen synthesis. However, when the levels of the integrin α1-subunit were analyzed by FACS, no significant differences were observed between WT and integrin α2KO mesangial cells (Figure 5D). Similarly, loss of integrin α1β1 did not lead to any changes in the levels of the α2-subunit (Figure 5D). Thus, a compensatory increase of integrin α1β1 in the integrin α2KO cells does not account for the decreased levels of collagen IV. Integrin α2-null mesangial cells produce less collagen IV than WT cells despite normal levels of ROS. (A) Serum-starved mesangial cells grown for 48 hours on uncoated dishes were lysed, and equal amounts of proteins (20 μg/lane) were analyzed by Western blot for levels of collagen IV. (B) Collagen IV and FAK (used to verifying loading) bands were quantified by densitometry analysis, and the collagen IV level is expressed as collagen IV/FAK ratio (CIV/FAK). Data are presented as the mean and SD of four experiments and represent fold changes relative to WT cells (assigned as one). Differences between WT and α1KO (*) or WT and α2KO (**) were significant (P<0.05). (C) ROS generation was determined in mesangial cells after incubation with 2 μM dihydro-rhodamine for 2 hours as described in Concise Methods. Data represent the mean and SD of three experiments performed. Integrin α1KO mesangial cells produce significantly more ROS than WT cells (*P<0.05), and no differences in ROS production are observed between WT and integrin α2KO cells. (D) Flow cytometry histograms of WT, α1KO, and α2KO primary mesangial cells incubated with anti-α1 or -α2 antibodies followed by phycoerythrin-conjugated secondary antibody. Integrin expression is displayed by a shift in mean fluorescent intensity compared with no primary antibody incubation. Based on the results obtained with the integrin α2KO mice and cells, we hypothesized that inhibition of integrin α2β1 may reduce glomerular sclerosis and improve renal function after injury in WT mice. Selective high-affinity small-molecule inhibitors of integrin α2β1, such as the thiazolidine-modified compound 15, have been designed and shown to allosterically inhibit integrin activation and adhesion of human platelets to fibrillar collagen and block thrombus formation in a murine model of arterial damage.16 Additionally, another thiazolidine-modified small-molecule inhibitor of integrin α2β1, SMI496, was shown to block collagen-induced angiogenesis in vitro and interfere with zebrafish embryo angiogenesis in vivo.18 To assess whether inhibition of integrin α2β1 by compound 15 results in decreased collagen IV synthesis, WT and integrin α2KO mesangial cells were incubated with this compound, and the levels of collagen were analyzed after 24 hours. As shown in Figure 6, treatment of WT cells with compound 15 significantly reduced collagen IV production; however, there were no significant effects on the collagen production of integrin α2KO mesangial cells, showing that its antifibrotic effects are integrin α2β1-dependent. Inhibition of integrin α2β1 decreases collagen IV production in WT mesangial cells. (A) WT and integrin α2KO mesangial cells were cultured for 24 hours with or without the small-molecule inhibitor compound 15 (10 μM). Equal amount of cell lysates (20 μg/ml) were subsequently analyzed by Western blot for levels of collagen IV. (B) Collagen IV and FAK bands were quantified by densitometry analysis, and the collagen IV level is expressed as collagen IV/FAK ratio (CIV/FAK). Data are presented as the mean and SD of three experiments and represent fold changes relative to WT cells (assigned as one). Differences between untreated versus treated WT cells (*) or WT versus α2KO cells (**) were significant (<0.05). We next determined whether compound 15 can be used in vivo to ameliorate glomerulosclerosis. Adriamycin was chosen to induce glomerular injury, because it induces proteinuria at a faster rate than the remnant kidney model. We initially defined when the protective effect of loss of integrin α2β1 becomes evident by comparing albuminuria over time in adriamycin-injected control (integrin α2 heterozygotes) and integrin α2KO mice. As previously described,17 albuminuria significantly increased in adriamycin-injected control mice starting at 1 week, peaked at 2 weeks, and declined at 4 weeks (Figure 7A). By contrast, albuminuria was reduced, although not statistically different, in adriamycin-injected integrin α2KO mice relative to control mice at 1 week (Figure 7A). The levels of albuminuria did not increase significantly between weeks 1 and 2 in integrin α2KO mice, and they were significantly more reduced than the levels of injured controls mice at 4 weeks (Figure 7A). Based on these results, we chose 2 weeks to analyze the effects of compound 15 on adriamycin-mediated glomerular injury. 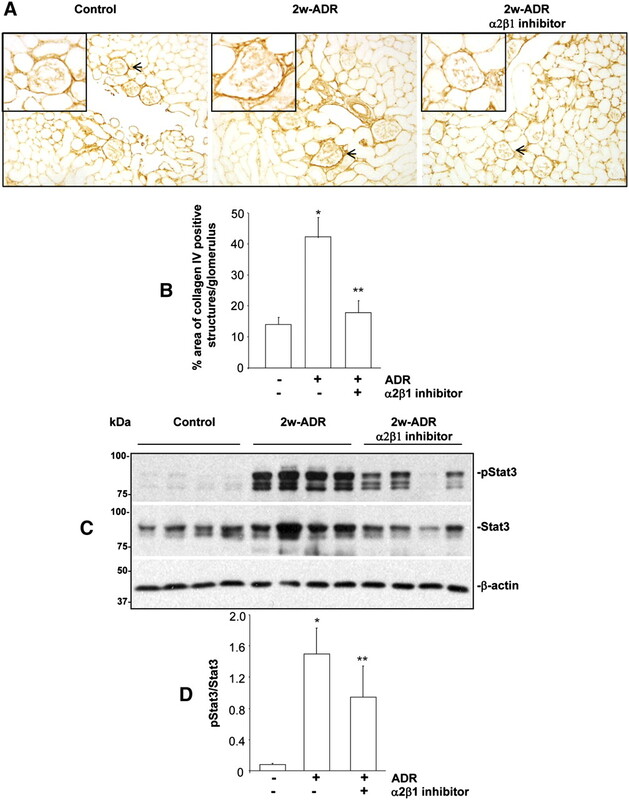 Inhibition of integrin α2β1 improves renal function in adriamycin-treated WT mice. (A) Integrins α2 heterozygotes and α2KO BALB/c mice (n=6–10/time point) were injected with adriamycin, and the urinary ACR was analyzed 0, 1, 2, and 4 weeks after adriamycin injection. Differences between untreated versus adriamycin-treated mice (*), adriamycin-treated mice at 2 versus 1 week (**), or adriamycin-treated α2 heterozygotes versus α2KO mice within the same time point (δ) were significant (P<0.05). (B) WT BALB/c mice (n=3) were injected with either PBS or 60 mg/kg integrin α2β1 inhibitor compound 15; 48 hours later, urine was collected and analyzed for the presence of inhibitor as described in Concise Methods. Shown is the elution profile of one sample of urine spotted with compound 15 as standard (15 μg/ml) and one sample of urine from a mouse treated with PBS or compound 15. Inset indicates the urinary concentration of compound 15 detected in the urine of three mice. (C–E) WT BALB/c mice were left untreated (n=8), injected with adriamycin (n=6), or injected with adriamycin and treated every second day with the integrin α2β1 inhibitor compound 15 (20 mg/kg, n=8). (C) The urinary ACR was analyzed 2 weeks after adriamycin injection. Data are presented as the mean and SD of six to eight mice and represent fold changes relative to adriamycin-treated mice (assigned as one). Differences between untreated versus adriamycin-treated mice (*) or adriamycin versus adriamycin plus compound 15-treated mice (**) were significant (P<0.05). (D) Periodic acid-Schiff images of kidneys from untreated mice or mice 2 weeks after adriamycin or adriamycin and compound 15 treatment. (E) The MSI of kidneys obtained from the mice described above was evaluated by a blinded observer and scored as described in Figure 2. Data are presented as the mean and SD of 120 glomeruli (30 glomeruli/mouse with a total of four mice evaluated; * and ** are the same as in C). We initially analyzed whether this compound, administered in mice by intraperitoneal injection, is secreted in the urine. To do this analysis, WT mice were injected with either PBS or compound 15 (60 mg/kg), and 24-hour urine collection was started 24 hours after treatment. As shown in Figure 7B, we could clearly detect a peak corresponding to compound 15 in the urine of treated mice but not the PBS-treated group. These data indicate that this compound reaches the organ of interest, the kidney, and it is highly stable. Next, WT BALB/c mice were injected with adriamycin and treated with either PBS or compound 15 (20 mg/kg every second day); 2 weeks after adriamycin injection, we detected significantly lower ACR in mice treated with the integrin α2β1 inhibitor than in the PBS-treated group (Figure 7C). Consistent with this decreased ACR, there was less glomerulosclerosis in mice treated with the integrin α2β1 inhibitor, which was confirmed by the significantly lower MSI in this group (Figure 7, D and E). Taken together, these results suggest that inhibiting integrin α2β1 is beneficial in glomerular injury and mimics the protective effects observed in injured integrin α2KO mice. Based on the observation that mesangial cells treated with compound 15 show reduced levels of collagen IV in vitro, we determined whether inhibition of integrin α2β1 in vivo had the same effect. Indeed, compound 15-treated mice showed a significant reduction in the levels of glomerular collagen IV compared with PBS-treated mice (Figure 8, A and B). Inhibition of integrin α2β1 decreases in vivo collagen IV production and STAT3 phosphorylation. (A) Frozen kidney sections of mice untreated, 2 weeks after adriamycin injection, or 2 weeks after adriamycin injection and treatment with the integrin α2β1 inhibitor compound 15 were stained with anticollagen IV antibodies. (B) The levels of collagen IV per glomerulus were quantified using Scion Image Analysis as described in Concise Methods. Data represent the mean and SD of 40 glomeruli (10 glomeruli/mouse with four mice analyzed). Differences between untreated and adriamycin-treated mice (*) or adriamycin versus adriamycin plus compound 15-treated mice (**) were significant (P<0.05). (C) Kidney lysates from the mice indicated above (n=4/group) were analyzed for the level of activated as well as total STAT3 by Western blot analysis. (D) pSTAT3 and total STAT3 bands were quantified by densitometry analysis, and the pSTAT3 level is expressed as pSTAT3/STAT3. Data are presented as the mean and SD of four kidneys per group (* and ** are the same as in B). A potential mechanism whereby integrin α2β1 may function as a positive regulator of collagen synthesis is by activating the signal transducer and activator of transcription 3 (Stat3).19 In addition, Stat3 activation has been shown to play a role in the progression of glomerulosclerosis in several animal models of kidney injury, including adriamycin-mediated nephropathy,20 and inhibitors of Stat3 activation have been shown to reduce glomerulosclerosis and improve renal function.21 We, therefore, determined whether treatment with compound 15 would alter Stat3 activation in vivo. We found that, whereas the kidneys of adriamycin-treated mice had increased levels of activated Stat3, treatment with compound 15 significantly reduced adriamycin-mediated Stat3 activation (Figure 8, C and D). To confirm whether activation of Stat3 is responsible for integrin α2β1-mediated collagen synthesis, we performed two complementary in vitro experiments. First, we inhibited the Stat3 pathway in WT and integrin α2KO primary mesangial cells with the Stat3 inhibitor WP1066 and examined collagen IV levels. Second, we activated the Stat3 pathway in integrin α2KO mesangial cells by expressing a constitutively active form of Stat3 (Stat3C) in which 2 amino acids in the C-terminal loop are replaced by cysteine, thus inducing spontaneous dimerization without changing tyrosine phosphorylation.22 The basal levels of phosphorylated Stat3 were significantly decreased in integrin α2KO mesangial cells compared with WT cells, suggesting reduced Stat3 activation in the null cells (Figure 9, A and B). Treatment with the Stat3 inhibitor WP1066 significantly decreased collagen IV in WT (Figure 9, C and D), suggesting that reduced Stat3 activation contributed to the reduced basal levels of collagen IV observed in the integrin α2KO mesangial cells. To determine if activation of Stat3 in integrin α2KO mesangial cells would increase collagen IV production, we analyzed the levels of collagen IV in integrin α2KO immortalized mesangial cells transfected with either vector control or Stat3C. Stat3C overexpression was confirmed by Western blot analysis with anti-FLAG antibodies, because the Stat3C construct carries a FLAG sequence at the C terminus (Figure 9E). We found that expression of Stat3C significantly increased collagen IV production in integrin α2KO mesangial cells (Figure 9, F and G). These results suggest that activation of Stat3 may account for the profibrotic effects of integrin α2β1 in renal injury. 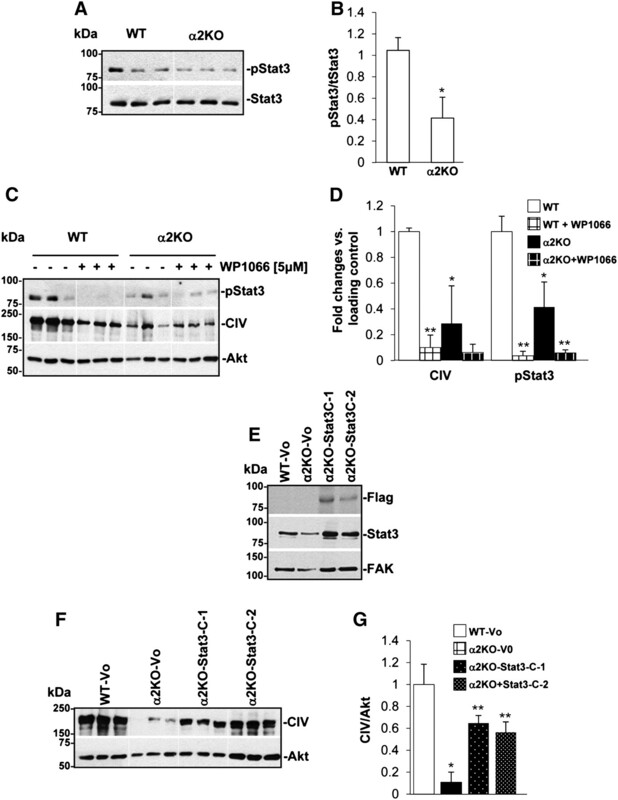 Reduced Stat3 phosphorylation in integrin α2KO mesangial cells contributes to reduced collagen IV production. (A) Basal levels of phosphorylated and total Stat3 were analyzed by Western blot in total cell lysates (20 μg/lane) of 24-hour serum-starved primary WT or α2KO mesangial cells (triplicate samples are shown). (B) pStat3 and total Stat3 bands were quantified by densitometry analysis, and the pStat3 level is expressed as pStat3/Stat3. Data are presented as the mean and SD of two experiments performed in triplicates and represent fold changes relative to WT cells (assigned as one). *Statistically significant (P<0.05) differences between WT and integrin α2KO cells. (C) pStat3, collagen IV, and Akt levels were analyzed in total cell lysates (20 μg/lane) of 24-hour serum-starved primary WT and α2KO mesangial cells untreated or treated with the Stat3 inhibitor WP1066. (D) The various bands were quantified by densitometry analysis, and the levels of collagen IV and pStat3 are expressed as collagen IV/Akt ratio or pStat3/Akt ratio. Data are presented as the mean and SD of two experiments performed in triplicates and represent fold changes relative to untreated WT cells (assigned as one). Differences between WT and α2KO cells (*) or untreated versus treated cells (**) were significant (P<0.05). (E and F) Total cell lysates (20 μg/ml) from immortalized WT or integrin α2KO mesangial cells transfected with empty vector (Vo) or constitutively active flagged Stat3 (Stat3C; two clones, C-1 and C-2, are shown) were analyzed by Western blot for levels of (E) Flag, (E) Stat3, or (F) collagen IV levels. (E) FAK and (F) Akt were used as a loading control. (G) Collagen IV and Akt bands were quantified by densitometry analysis, and the collagen IV level is expressed as collagen IV/Akt ratio. Data represent the mean and SD of a representative experiment performed in triplicates and represent fold changes relative to WT-Vo cells (assigned as one). Differences between WT-Vo versus α2KO-Vo cells (*) or α2KO-Vo versus Stat3C-expressing α2KO cells (**) were significant (<0.05). The role of integrin α2β1 in glomerular homeostasis is, at present, controversial. Analysis of integrin α2-null mice, which develop mild proteinuria and glomerular matrix deposition at 6 months of age, suggests that integrin α2β1 protects from renal injury.9 However, crossing the integrin α2-null mice onto the COL4A3-null mice, a mouse model of progressive renal fibrosis, results in improved survival and renal function, suggesting that integrin α2β1 contributes to injury (Gross O. et al., unpublished data). In this study, we provide evidence that integrin α2β1 is a positive regulator of collagen synthesis and contributes to glomerular injury. In this context, we show that, after adriamycin- or 5/6 nephrectomy-induced injury, integrin α2-null mice have reduced albuminuria accompanied by reduced glomerulosclerosis and collagen deposition. Most importantly, we show that in vivo treatment of adriamycin-injected mice with a selective integrin α2β1 small-molecule inhibitor results in improved renal function, decreased glomerulosclerosis, and decreased collagen deposition. Thus, targeting integrin α2β1 might be a plausible way to reduce glomerular scarring after injury. The use of integrin α2β1 inhibitors in all studies highlighted above has been for short duration. We now show, for the first time, that compound 15 used over a period of 2 weeks ameliorates the effects of adriamycin-induced nephropathy by improving renal function, which was measured by ACR, and reducing extracellular matrix deposition. We were able to detect compound 15 in the urine of mice treated with this inhibitor, clearly indicating that this compound reaches the organ of interest, the kidney, and is highly stable. Our in vitro studies showing that compound 15 decreases collagen IV production by mesangial cells suggest that mesangial cells are indeed capable of responding to the inhibitor. These data, together with the finding that, within the glomerulus, mesangial cells express integrin α2β1,3 make these cells a relevant and/or major in vivo target for compound 15. Although the primary purpose of this study was to analyze the role of integrin α2β1 in the course of glomerular injury, we also provide evidence that integrin α1β1 is a negative modulator of glomerulosclerosis in a 5/6-nephrectomy model as well as the previously described adriamycin model.3 Integrins α1β1 and α2β1 are coexpressed in many cells, including mesangial cells.3 They play opposite functions when activated by collagen, and they can also affect the functions of the other.26 Although loss of integrin α1β1 leads to increased levels of EGF receptor activation, ROS production, and consequent collagen synthesis/deposition compared with WT cells and/or mice,3,6,7 loss of integrin α2β1 does not seem to have a protective role because of decreased EGF receptor activation or ROS production; no differences in EGF receptor phosphorylation (not shown) or ROS levels (Figure 5C) were observed between WT and integrin α2-null cells. Previous studies indicated that the profibrotic Janus kinas (JAK)/Stat signaling pathway is activated in adriamycin-mediated nephropathy,20 and inhibition of this pathway with the JAK2 inhibitor AG490 ameliorates adriamycin-induced nephropathy.21 Furthermore, integrin α2β1 binding to collagen I was shown to induce Stat3 activation.19 We provide evidence that there are significant reductions in Stat3 activation in the kidneys of adriamycin-treated mice subjected to compound 15. This result suggests that a possible explanation for the protective effect of integrin α2β1 inhibition is that blocking integrin/collagen interactions results in decreased Stat3 activation with consequent decreased collagen deposition and amelioration of glomerular damage. This hypothesis is supported by our in vitro study showing that integrin α2KO mesangial cells show reduced basal levels of activated Stat3 and collagen synthesis, whereas enhancing Stat3 activation is sufficient to increase collagen levels. Whether integrin α2β1 expression changes in kidney diseases and how this change might contribute to disease is currently unknown. Integrin α2β1 is expressed mainly in the mesangium and distal tubules, with lower levels in glomerular endothelial cells in normal human kidney.27 There is increased mesangial expression of integrin α2β1 in patients with diabetic nephropathy28 and increased proximal tubular staining in cellular crescents in patients with rapidly progressive glomerulonephritis.29 In contrast, in patients with IgA nephropathy, mesangial expression of integrin α2β1 is unchanged, although there are areas of interstitial scarring and damaged tubules.30 Although the activation state of integrin α2β1 in these disease processes is unknown, it is possible that there is both increased expression and/or activity of integrin α2β1 in human glomerular diseases, which would make this collagen receptor a potential therapeutic target to ameliorate renal fibrosis in humans. All the in vivo experiments were performed according to institutional animal care guidelines and conducted in Association for Assessment and Accreditation of Laboratory Animal Care–accredited facilities. For adriamycin-mediated glomerulosclerosis, WT, integrin α2 heterozygotes, and integrin α1KO and α2KO BALB/c male mice (6 weeks old, 20 g body wt) received a single intravenous injection of adriamycin (10 mg/kg; Sigma, St. Louis, MO3), and mice were killed 0, 1, 2, 4, or 8 weeks after injection. Eight weeks were chosen, because at this time point, most of the integrin α1KO mice develop severe glomerular injury and proteinuria3; 5–10 mice/genotype were used for this set of experiments. The integrin α1KO mice were backcrossed onto the BALB/c background for nine generations and used to analyze the effect of ROS- or diabetes-mediated glomerular injury.3,5 The integrin α2KO mice were backcrossed onto the BALB/c background for nine generations. The control mice used in the study represent either WT or heterozygotes littermates derived from α2het × α2het BALB/c mating. For the remnant kidney model (5/6 nephrectomy), WT and integrin α1KO and α2KO 129Sv/ev male mice (6–7 weeks old, 20–23 g body wt) underwent 5/6 nephrectomy or sham operation as described.15 Mice were sacrificed 12 weeks after injury. Nine mice/genotype were used for this set of experiments. The integrin α1KO and α2KO mice were backcrossed onto the 129Sv/ev background for 10 generations. The control mice used in the study represent WT littermates derived from α2het × α2het 129Sv/ev mating. For the experiments with the small-molecule integrin α2β1 inhibitor thiazolidine-modified compound 15 (synthesized as previously described16), WT BALB/c mice received a single intravenous injection of adriamycin (10 mg/kg), and then, they were either treated with PBS or treated every second day with compound 15 (20 mg/kg intraperitoneal injection). Mice were sacrificed 2 weeks after adriamycin injection. Two weeks were chosen, because at this time point, WT mice present high proteinuria and visible glomerular injury.17 Six to nine mice per treatment were used for this experiment. For the analysis of albuminuria, 24-hour urine collection was performed immediately before sacrifice, and the concentration of urine albumin and creatinine was measured using the ELISA Albuwell M test and kit (Exocel Inc., Philadelphia, PA). For time course experiments, urine was collected at 0, 1, 2, and 4 weeks after injury (i.e., adriamycin injection), and the concentration of urine albumin and creatinine was measured as described above. The ACR was expressed as micrograms per milligram. For histologic analysis, kidneys, removed immediately after the mice were killed, were either fixed in 4% formaldehyde and embedded in paraffin for morphologic and immunohistochemistry analysis or embedded in Optimal Cutting Temperature compound for immunofluorescence or Western blot analysis. The paraffin tissue sections were stained with periodic acid-Schiff, hematoxylin/eosin, and Trichrome for the evaluation of glomerular injury. The MSI was evaluated in a blinded fashion as previously described.31 Briefly the percentage of mesangial matrix occupying each glomerulus was rated as one (0–24%), two (25–49%), three (50–74%), and four (>75%). Kidneys from four mice per genotype or treatment with a total of 120 glomeruli were analyzed, and the MSI was expressed as mean ± SD. Collagen IV deposition in uninjured, adriamycin-treated, or 5/6 nephrectomy-injured mice as well as adriamycin-injured mice untreated or treated with the integrin α2β1 inhibitor compound 15 was analyzed on paraffin kidney sections using anti-mouse collagen IV antibodies (1:100; Biodesign, Saco, ME) followed by horseradish peroxidase-conjugated secondary antibodies (Santa Cruz, CA) and Sigma Fast DAB chromogenic tablets (Sigma, St. Louis, MO). Quantification of glomerular collagen IV was performed using the Scion Image Program as described.32 Collagen IV was expressed as percentage of area occupied by collagen IV-positive structures per glomerulus; 10 glomeruli per mouse, with a total of four mice per treatment, were analyzed. Primary mesangial cells were isolated from WT or integrin α2KO mice as previously described.3 Immortalized mesangial cells were obtained by crossing WT or integrin α2KO mice with the immorto mouse as previously described.6 Immortalized mesangial cells were propagated at 33°C in the presence of 100 IU/ml IFN-γ. For experiments, cells were cultured at 37°C without IFN-γ for at least 3 days before use, because this time is optimal for conditionally immortalized mesangial cells to acquire a phenotype similar to the phenotype of freshly isolated primary mesangial cells.6 To generate Stat3C-expressing mesangial cells, 3×105 immortalized α2KO mesangial cells were transfected with 2 µg mouse pRCStat3C (plasmid 8722; Addgene) or pcDNA-neo empty vector using Lipofectamine Plus (Invitrogen, Grand Island, NY) followed by G418 (0.6 mg/ml) selection and analysis of Stat3C expression by Western blot with anti-FLAG antibodies. Two different clones of Stat3C-expressing integrin a2KO mesangial cells were used for analysis. ROS production was measured as previously described.6 Briefly, 1.5×105 primary WT, α1-null, and α2-null mesangial cells were plated in six-well plates in DMEM containing 10% FCS. After 2 days, the cells were washed and incubated in serum-free medium with 2 μM dehydroethidium (Sigma). After 2 hours, cells were collected, and dehydroethium-derived fluorescence was analyzed by a FACScan (BD Biosciences). Three independent experiments were performed in triplicate. To analyze the expression levels of integrin α1- and α2-subunits, WT and integrin α1- and α2-null mesangial cells were incubated with anti-integrin α1 or α2 antibodies for 45 minutes, washed, incubated with appropriate phycoerythrin-conjugated secondary antibodies, and analyzed with a FACScan. Three independent experiments were performed. Mice (n=3) received a single intraperitoneal injection of either PBS or the integrin α2β1 inhibitor compound 15 (60 mg/kg), and the urinary levels of the inhibitor were analyzed 48 hours after treatment. Briefly, 200 μl urine were salt-out with 40 mg NaCl and extracted with 1000 μl EtOAc; then, 850 μl organic phase were dried under the stream of nitrogen and redissolved in 50 μl 20% acetonitrile/0.1% trifluoroacetic acid. An aliquot of 1 μl was injected onto ACQUITY BEH C18 column (1×100 mm) and eluted with a linear gradient of acetonitrile at 0.1 ml/min using an ACQUITY UPLC system with ultraviolet detection at 220 nm. The concentration of the integrin α2β1 inhibitor was calculated from standard curves generated in identical conditions. Extraction efficiency (∼85%) was estimated using known amounts of inhibitor spiked into mouse urine. For analysis of collagen IV and STAT3 in mice, 15-μm frozen kidney sections were washed two times in PBS to remove OCT and then lysed in sample buffer (62.5 mM Tris, pH 6.8, 2% SDS, and 10% glycerol). For analysis of pStat3 and total Stat3 in primary or immortalized mesangial cells, 5×104 cells were plated in six-well plates. Eighteen hours later, cells were incubated in serum-free media with or without the Stat3 inhibitor WP1066 (5 μM; Calbiochem); 24 hours later, cells were lysed in sample buffer. Equal amounts of total proteins (∼20 μg/lane) were resolved in 6% SDS-PAGE, transferred onto nitrocellulose, and probed with anticollagen IV (Biodesign), antiphospho-Stat3 (Cell Signaling), anti-Stat3 (Cell Signaling), β-actin (Santa Cruz), or total Akt (Cell Signaling) followed by horseradish peroxidase-conjugated secondary antibodies. To analyze the levels of collagen IV in mesangial cells, 5×104 cells were plated in six-well plates. After 24 hours, the cells were incubated in serum-free medium with or without compound 15 (10 μM) or the Stat3 inhibitor WP1066 (5 μM). After 24 hours, the cells were lysed in Tris (50 mM, pH 7.5), NaCl (150 mM), 1% Triton X-100, and 1% sodium deoxycholate. Equal amounts of total proteins (∼20 μg/lane) were resolved in 6% SDS-PAGE, transferred onto nitrocellulose, and then probed with anticollagen IV or anti-focal adhesion kinas (FAK) (Santa Cruz) followed by horseradish peroxidase-conjugated secondary antibodies. Collagen IV and β-actin or FAK as well as pStat3 and Stat3 bands were quantified by densitometry analysis; the collagen IV signal was expressed as a collagen IV/β-actin or collagen IV/FAK ratio, whereas the pStat3 levels were expressed as pStat3/Stat3 ratio. We used the t test for comparisons between two groups and ANOVA using Sigma-Stat software for statistical differences between multiple groups. P≤0.05 was considered statistically significant. These studies were in part supported by a Merit Review from the Department of Veterans Affairs (R.Z. and A.P. ), National Institutes of Health Grants 2P01DK065123 (to R.Z. and A.P. ), DK075594 (to R.Z. ), and DK083187 (to R.Z. ), an American Heart Association Established Investigator Award (to R.Z. ), and O’Brien Grant P30DK79341-01 (to R.Z. and A.P.). : Cross-talk between integrins alpha1beta1 and alpha2beta1 in renal epithelial cells. Exp Cell Res 314: 3593–3604, 2008. The integrin-collagen connection - a glue for tissue repair?